This 4.5 Litres version of the Ardbeg Committee Rollercoaster was photographed by Keith Wood from the Whisky Emporium at the 2010 Munich Whisky Festival. I was told that all Committee members in Germany were sent an email about receiving a free dram of the Rollercoaster. 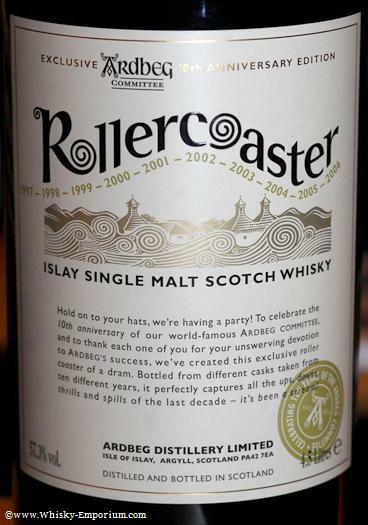 This bottle was opened and the 10th Anniversary Rollercoaster was poured freely to the eager whisky fans. NOTE: There were no bottles of Rollercoaster (70cl or 4.5L) for sale at the Munich Whisky Festival. UPDATE (March 24th, 2010): I was told by a little bird that 5 of these bottles were allocated to France for marketing purposes. None of them are supposed to be for sale, which makes us think that maybe there are up to 5 per major market for the purposes of marketing. More details will be posted as they become available. UPDATE (April 26th, 2010): A 4.5L Rollercoaster made an appearance in Chicago for Mickey Heads class at Whisky Fest and the 10th Anniversary Committee Party. Unfortunately, I couldn't pry any information from Dorothy Bakker Lee (Ardbeg USA), Davinia Small, Mickey Heads or Hamish Torrie about the 4.5L bottles. If you ever find out any secrets about Ardbeg, it didn't originate from any of these nice folks. They were all incredibly friendly, and very enthusiastic about Ardbeg and all of the Ardnuts out there. UPDATE (August 22nd, 2010): I was able to find the bottle code on an empty 4.5L Rollercoaster, and it looks like this 'Beast' was bottled after the US (750ml) version, but before the UK (70cl) version. See bottle codes below for reference. I still don't have any specifics of how many of the 4.5L bottles were produced, but it would seem like there were many more than we originally predicted. Hamish Torrie, Mickey Heads and Dorothy Bakker Lee - Oh, and the Rollercoaster! Here is a list of the Ardbeg Committee celebrations planned during 2010. If you have any other information about the 4.5L Rollercoaster, please feel free to contact us with the details.